A group of energy companies in the U.S. and Mexico is looking to build two sizeable natural gas pipelines in West Texas that would pump gas to power plants across the border. We spoke with Big Bend Sentinel reporter Sasha von Oldershausen about developments on one of the pipelines – which would run through parts of Big Bend country. Landmen representing Trans Pecos Pipeline, LLC. – the company formed to facilitate the project – have begun scouting possible routes for the pipeline, distributing letters to landowners in the Brewster, Jeff Davis and Presidio County area, asking permission to conduct surveys of their properties. Von Oldershausen says some landowners have reservations about the way the process is unfolding – they want more details. Energy Transfer – the Dallas-based company that would build the pipelines – says it plans to have both lines up and running by early 2017. Some Big Bend residents are worried about how the project would affect the pristine quality of life in the region, but as von Oldershausen tells us, Trans Pecos Pipeline appears willing to invoke eminent domain laws to carry out the project. 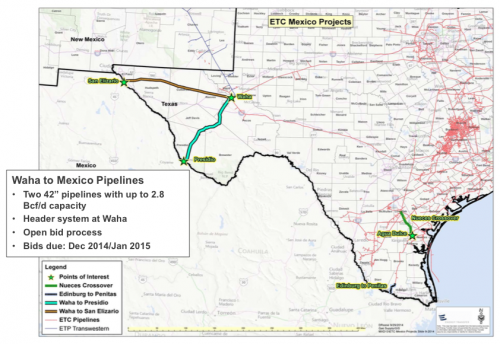 This entry was posted in KRTS News and tagged Energy Transfer, Trans Pecos Pipeline, West Texas to Mexico Pipeline. Bookmark the permalink.